Finding the right painting contractors to tackle your residential painting, power washing, or deck refinishing job is the most important step of the process. In New Britain, Connecticut, local residents and business owners depend on Gantner Painting for all of their painting needs. Experience: Gantner Painting has been a locally owned and operated painting company for over 30 years. They are fully licensed and insured. With so many years in the business, you can trust they’ll have the experience, skills, and tools to tackle your paint job with ease. To see for yourself, ask them for references or photos of their past work. Commitment To Customer Satisfaction: At Gantner Painting, a job is not complete until the customer is completely satisfied. From your first phone call to schedule an estimate to the final day of work, Gantner Painting will work tirelessly to ensure your painting project goes off without a hitch. When you hire these painting contractors, you can rest easy knowing you’ll receive high-quality work and professionalism. Wide Range Of Services: To better serve their customers, Gantner Painting proudly offers a wide range of services beyond basic residential and commercial painting. Gantner Painting also specializes in deck refinishing, power washing, aluminum siding refinishing, and staining. As always, they offer free estimates so you can budget accordingly. If you live in the greater New Britain, Connecticut area, and you’re looking for experienced painting contractors that specialize in residential painting, power washing, and deck refinishing, call Gantner Painting today at (860) 225-8577 to schedule your consultation. 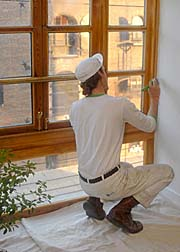 To find out more about their residential and commercial painting services, visit their website. Other Announcements, Events and Deals from Gantner Painting Co.